Part of the People Media network, a subsidiary of top online dating site Match.com, OurTime is an online dating website geared toward singles over the age of 50 who are looking for all types of relationships, including marriage, travel companionship or even pen pals. The website launched in 2011 after the company extensively researched the preferences of older people looking for companionship online. Since its launch, OurTime has grown exponentially and has become one of the top online dating sites catering to a more mature population. Unlike some of the more mainstream dating sites, OurTime offers a solitary premium plan which allows singles to take advantage of all of the features offered. The service also offers a free plan which provides limited services but enables users to get a good feel for the service. For an additional fee OurTime users can also opt to have their profile highlighted in the search results, a feature that is designed to help bring users to the forefront of relevant searches. This is only available as an upgrade for premium members, though it only cost a dollar more per month, and will make your profile even more visible. For an additional fee OurTime users can also opt to have their profile highlighted in the search results, a feature that is designed to help bring users to the forefront of relevant searches. This is only available as an upgrade for premium members, though it only cost a dollar more per month, and will make your profile even more visible. OurTime is unquestionably one of the most intuitive online dating services we've tested, as the system provides a wealth of helpful information including who's flirted with you, who's "favorited" you and who's viewed your profile. OurTime's straightforward approach provides a distinct advantage for singles who don't want to have to guess how people feel about them. OurTime offers singles the combination of a searchable database as well as daily search suggestions, which are aimed at bringing relevant partners to the users' attention so that they can start getting to know their potential matches as soon as possible. 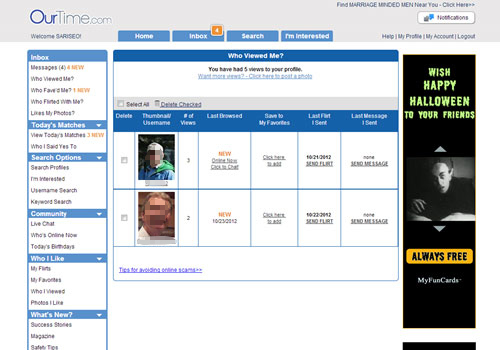 Singles using the search feature offered by OurTime can choose a basic search that allows them to choose profiles with specific elements, such as videos or photos - which means you can easily weed out profiles without pictures. The advanced search feature affords singles the opportunity to narrow down their options by selecting suitors with specific physical characteristics, astrological signs, religious beliefs or relationship expectations. Singles can also search with specific keywords or by distance, a feature that can be especially useful for anyone who isn't interested in a long-distance relationship. In addition to excellent search functions, OurTime has an excellent storage feature through which singles can easily keep track of people they like, photos they like, and profiles they've viewed. Finally, it's worth noting that OurTime allows users to see who else is online when they are, which can be especially useful for anyone who wants to start chatting immediately. Look through profiles that might be of your interest. Signing up for OurTime is a painless procedure, allowing singles to get started without completing their entire profiles. Background questions include standard inquiries such as how many children the user has, his or her location and physical appearance, among other general characteristics. There are two main ways to find answers to questions about OurTime. The fastest way is to search the company's FAQ section, or to use the search button in the help section if you have a specific question. We tested the search feature and found that it did provide helpful and relevant responses to our queries for basic searches and worked quickly every single time. Singles who can't find answers in the FAQ section can contact the company via an on-site form submission. Before submitting the question users will be directed to potential answers to their questions which seem to be based upon trigger words from the email. Members who don't locate their answers in this form may of course still opt to submit the question for a personalized answer from the customer service team. OurTime is a solid niche online dating website that attracts precisely the users it seeks, but also features many profiles of users outside of its target audience. Though the site lacks many of the bells and whistles offered by other dating sites, it does provide a straightforward user experience and excellent search features to help maximize user's odds of success. 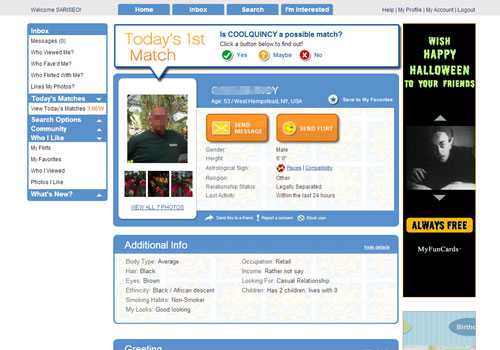 The website also provides more ways to interact with matches than a typical dating site, meaning that there is always fun to be had with this unique online site. Used this site in 2012-2013. Was almost ready to let membership lapse and move to Rochester to live near kids & grand kids. But I had met more men here than any other site..so kept going a few more weeks. Then HE happened. We met November 5, 2012...we both knew it was right. We were engaged Jan 2013 and married June 15th 2013. Kids asked why so fast..we said at our age we needed all the time God would give us. It has been a joyous ride. I met several very nice men and dated, but have met "THE ONE" on another website. It's a great site and I met the most wonderful guy. We are going on 9 months. I was repeatedly matched with the same individuals over and over. I was matched with several people whom I had blocked. I was matched with several individuals who I reported as catfish/cons. I never had technical problems resolved after repeatedly contacting customer service. I doubt they even have a tech department. The best senior dating site available.Very few fake profiles. 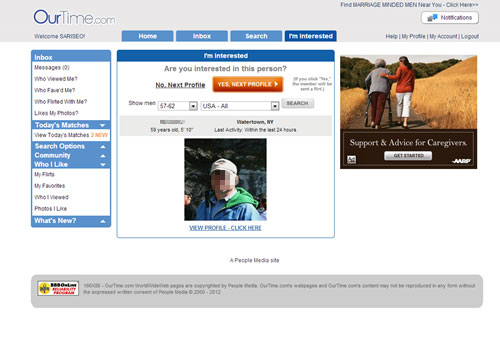 Members seem friendly.Profile set up easy, non complicated, yet concise.Had many dates from this site.